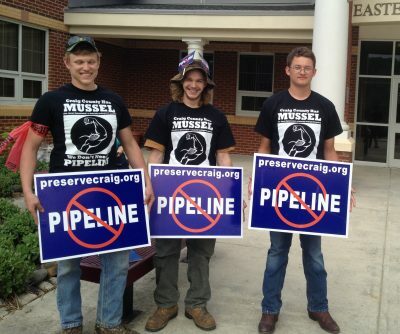 The James River Spinymussel crew of Craig County outside the first of two public hearings on the proposed Mountain Valley Pipeline. The lawsuit filed today in the U.S. Fourth Circuit Court of Appeals seeks to invalidate West Virginia’s water quality certification for the pipeline and require the state to reconsider whether the project can go forward in compliance with the Clean Water Act. The suit was filed by attorneys with the Appalachian Mountain Advocates on behalf of Appalachian Voices, West Virginia Rivers Coalition, Indian Creek Watershed Association, Sierra Club and Chesapeake Climate Action Network.